Due to its popularity amongst just about everybody, there is often discussion of coffee in the media, debating back and forth as to whether it is advantageous for health or detrimental. Before we get into that, however, it is worth starting with what caffeine actually does when we consume it. Adenosine is a neurotransmitter which causes us to become sleepy when it is received by the brain. Adenosine naturally rises as the day goes on, which makes sense, since we obviously want to get more tired towards night-time, when we want to go to sleep. Simply put, adenosine in the brain rises throughout the day, making us more tired as the day goes on. Note: You may have heard of adenosine, if you’ve previously heard me talking about energy production, with adenosine triphosphate (ATP) being known as the energy currency within the body. Anyway, when we consume caffeine, the caffeine, being similar in structure to the adenosine molecules, is received by the same receptors as the adenosine would have been, stopping the adenosine from being received by the brain. This means that the adenosine will not get a chance to tell the brain to become sleepy. Simply put, the caffeine blocks some of the adenosine from being received by the brain. Therefore, caffeine can be seen as something that helps you avoid the sleepy feeling, which obviously then leads to the perception of feeling more “awake”. We do, however, also get the added effect of a temporary increase in dopamine production, which is a reason that we get the slight euphoric feeling when we consume caffeine (and perhaps explains why, as the Instagram memes will tell you, people become a little bit more tolerable after we’ve had out morning cup of coffee!) It also seems to improve cognitive skills, affecting memory, decision making and reaction time. With consistent caffeine consumption, more adenosine receptors are created in the brain, so that eventually the adenosine is getting through to create that sleepy feeling, even with caffeine being consumed. This leads to the need for extra caffeine consumption in order to get the same effect that less caffeine used to create. This is what people usually refer to as building up a caffeine tolerance. In terms of benefits and considerations, there are a few different aspects related to coffee intake that are worth considering. I’ve divided this discussion up into three topics: Coffee and Health, Coffee and Performance, and Coffee and Body Composition. Coffee, along with most other popular nutrition topics, has gone back and forth in the media in terms of whether it is healthy or unhealthy. Previously, it was thought that coffee consumption was a cause of things like osteoporosis, heart disease and cancer. However, that has been shown not to be true, when other lifestyle choices have been taken into account, as well as when caffeine intake is kept to moderate levels. In fact, regular coffee consumption may be slightly protective of some diseases, including some types of cancer. Caffeine has also been shown to improve mental performance, as well as being correlated with improved mood, and depression being lower in people who drink coffee. People are also often concerned with dehydration when it comes to coffee consumption. It is true to say that coffee has a slight diuretic effect on the body, which essentially means it makes you want to urinate. This could be taken to mean that you are excreting extra fluid that you wouldn’t have excreted if you hadn’t had the coffee, which is true! However, we have also just consumed some extra fluid (from the coffee). It turns out that the extra fluid excreted is generally less than the extra fluid taken in, leading to a slight net hydrating effect. I would say that this probably changes a bit when we look smaller drinks like an espresso, for example, which provides less fluid, but due to the similar caffeine content, probably provides the same diuretic effect as a larger coffee. In this case, I would hazard a guess at saying this might have a slight dehydrating effect, but this can easily be offset by having an extra glass of water. Caffeine has a half-life of about 6 hours, meaning that if we were to consume 100mg of caffeine, 6 hours later there would be 50mg in the body. 6 hours later than that there would be 25mg, and so on. This will vary with how quickly the individual metabolises caffeine. With this information, we can see that it’s probably a good idea to have a caffeine cut-off time early in the day, so that there isn’t a lot of caffeine in the body when you are trying to wind down and go to sleep. For this reason, it is probably also worth limiting the amount of coffee you have in a day, since the amount you take in will also have an effect on how much is circulating in the body later in the evening. As you probably know, sleep is hugely important to overall health. Even if the caffeine is not keeping us awake at night, it can still effect the quality of our sleep. When it comes to body composition, the first thing we usually want to talk about is calorie content. In this case, a black coffee has very few calories, but if we start to add other ingredients to it, such as milk, cream, sugar etc, the calories can start to add up. For this reason, whether coffee consumption leads to weight-gain from a calorie point of view, really depends on what other ingredients are being added to it. It is also worth noting that people often feel the need to consume confectionery foods such as chocolate or biscuits with coffee, so if that is the case, then these extras have to be taken into account also. It is also worth mentioning that caffeine is often also found in sugary drinks, and these will also contain extra calories. On the other hand, coffee does slightly increase the metabolic rate, meaning that you burn slightly more calories in a given time, after consumption of caffeine, but probably not enough to justify that muffin you might have had alongside it. This increase in metabolic rate is the reason that caffeine-rich fat-burners are said to ‘work’, and to a certain extent they do work for this reason. However, it is worth treating the consumption of this caffeine in the same way you would the caffeine from coffee, as in, not over-consuming it and limiting your use later in the day, so that it won’t effect sleep quality or quantity. Caffeine also up-regulates fat oxidation, meaning that when you consume coffee, you will burn more fat for energy in the following hours. This doesn’t necessarily mean extra body-fat loss. This will still be determined by whether you are in a caloric deficit or not. Another aspect of coffee that is related to body composition is it’s effect on appetite. It isn’t quite clear what causes the appetite suppressing feeling a lot of people claim to get, if it does exist. To my knowledge, there’s no mechanism in terms of it effecting the hunger and satiety hormones ghrelin and leptin, so perhaps it’s more to do with the feeling of enjoying the taste of a cup of coffee leading to decreased desire for other food. However, a lot of people seem to claim appetite-suppressing effects, and I would include myself in that bracket, so it may be worth noting. This could help make it easier for people to eat less and therefore lose weight. Obviously the previously mentioned topics of health and body composition are going to lead into performance. Generally, a healthier body is going to perform better, and a better body composition is usually better for performance, all else equal. But apart for that, there are a few other things to discuss as regards caffeine and sports performance. Earlier, I mentioned that caffeine increases the rate of fat oxidation. This has been theorised to improve sporting performance, at least when time to exhaustion is the measure of success. This is due to the idea that if we can increase fat oxidation (i.e. the amount of fat we are using for fuel), we spare our carbohydrate (glycogen) stores in the body, and therefore the carbohydrate can be saved for later in the event. However, in sporting activities where we aren’t going to a point of exhaustion (most sports), this increase in fat oxidation could also be described as a decrease in the ability to use carbohydrate. However, we know that carbohydrate is a more quickly converted fuel source, and is therefore more suited to the high-intensity types of activity that we see in field sports, for example. 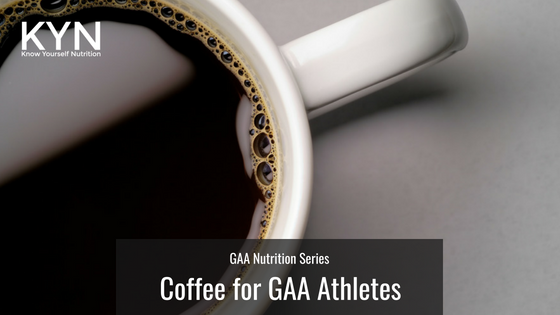 Regardless of this, caffeine has been shown to improve anaerobic performance, which is a big component of GAA sports. The mental alertness and reaction time improvement that comes with caffeine consumption could also be a factor in sports where skill is required. It has also been shown to increase strength, which is obviously good in strength sports, but is also helpful in sports that require an element of gym work. It’s also worth considering the mood elevation often experienced with caffeine could potentially lead to better training performance and therefore carry-over to better performance in competition. In terms of practicality having 200–400mg of caffeine, or around 1–2 cups of coffee, 30–60 minutes pre-workout, or pre-training, or pre-match would be advised, but again, the amount and timing will depend on the individual. There are other ways of consuming this caffeine, including pre-workout formulae, caffeine tablets or gum, energy gels etc. Keep caffeine intake at a level that doesn’t effect your sleep negatively, and have a cut-off time for the same reason. As much as possible, save coffee consumption for times when it is going to benefit you, as you can build up a tolerance if you consume too much, too often. Don’t be afraid of coffee consumption if you enjoy it, if it makes you feel good, you drink it in sensible amounts and it doesn’t negatively effect your health, body composition, and performance.